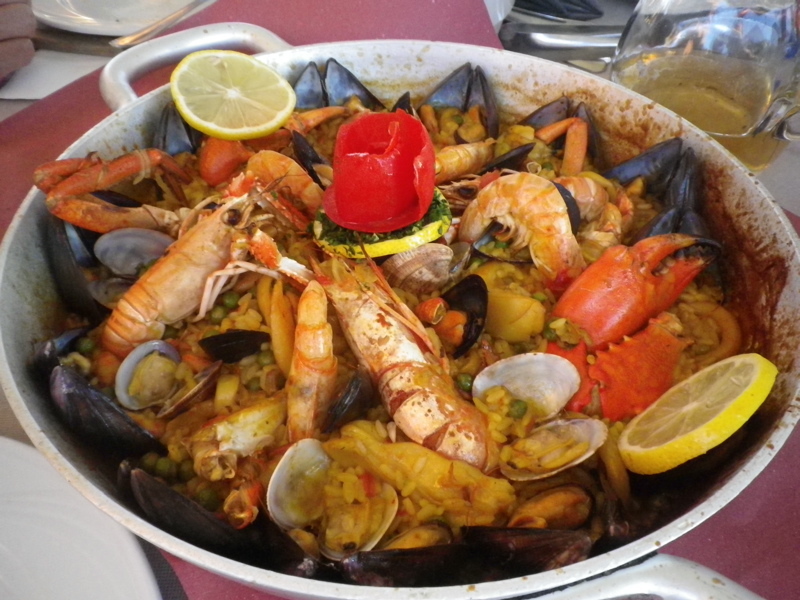 For our last holiday dinner we had ordered paella at Da Tony, which was just wonderful. It seemed pricey, at 48 euro, and the menu said minimum two people. 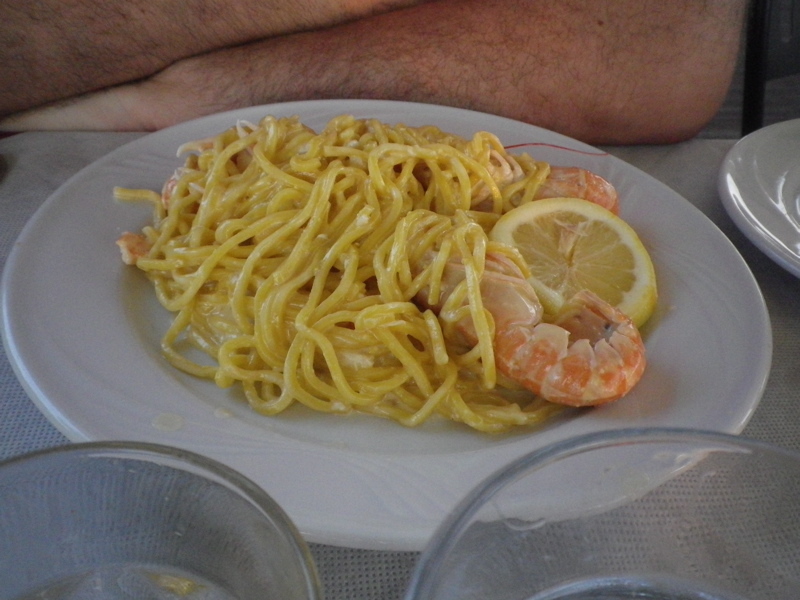 However, as you can see it was more than enough for four people to share, with masses of fresh seafood piled on. Definitely something to enjoy again. 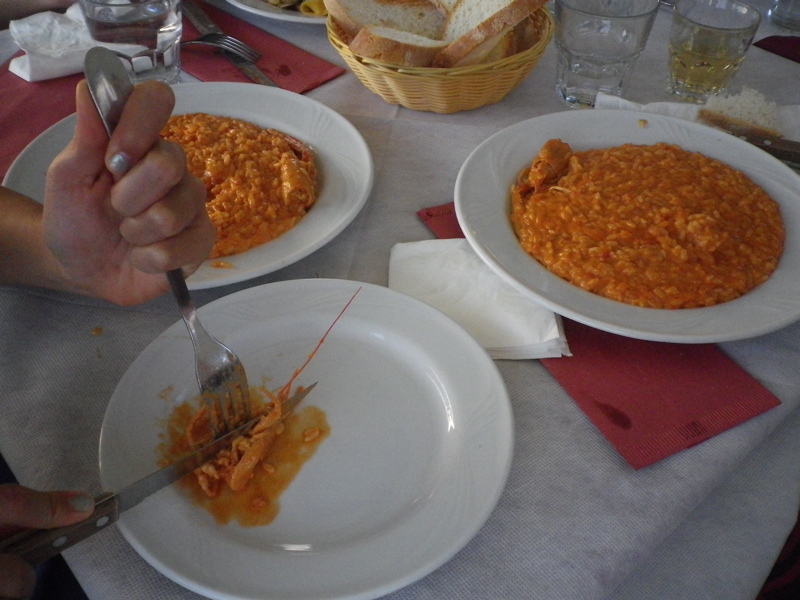 I should dig out that paella pan (wedding gift) and try, though I am not sure where to find paella rice in Rome. Castroni, possibly? Or would using risotto rice in paella be an abomination? 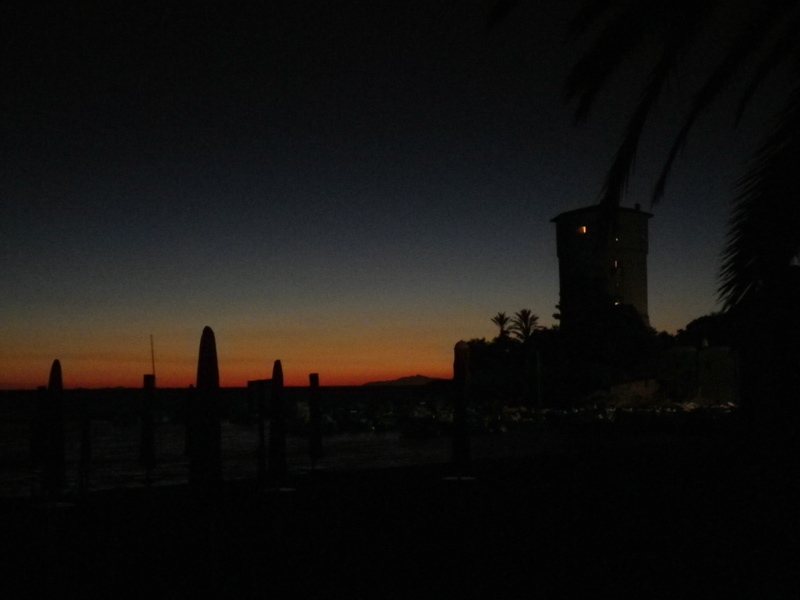 Sunset over the tower and beach. Next morning: Luggage packed, all set for going back to Rome. Some by car, and some by taxi, ferry, bus, a very hot train, and bus…… Very warm experience. That shower waiting in the other end was very appreciated, before unpacking all the laundry and piles of holiday books. Also, some last-minute purchases. 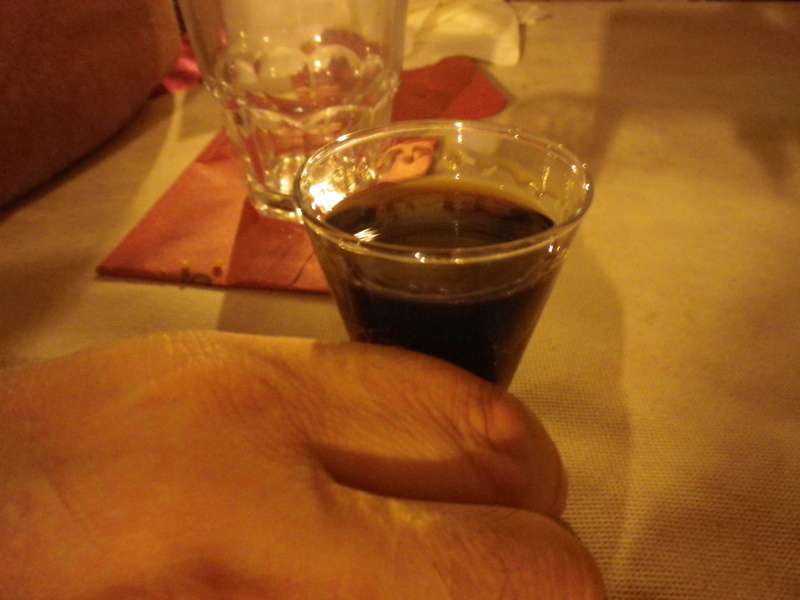 On the left: Amaro del Giglio, which is fantastic, one of my favourite amari. We bring some back to Rome every summer. 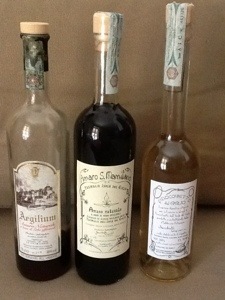 Amari (bitters) are Italian herbal liqueurs, usually bitter-sweet, served as a digestive after the meal. Lots of variations, beside the classics (Averna, Lucano, Montenegro, Ramazotti) and the homemade ones can be interesting. Ingredients may include herbs, spices, roots, citrus peel and more. Plus two new bottles to try, we found them in Giglio Porto: an amaro from the “antica farmacia” on Giglio (have not seen that one before) and a finochietto (fennel liqueur). 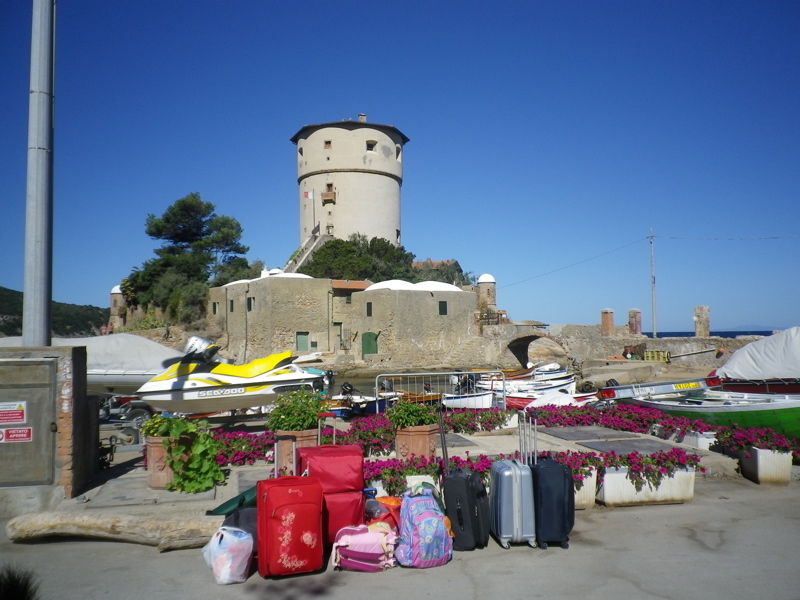 This entry was posted in Italy, travel and tagged Giglio, summer, Tuscany on August 8, 2013 by krumkaker. 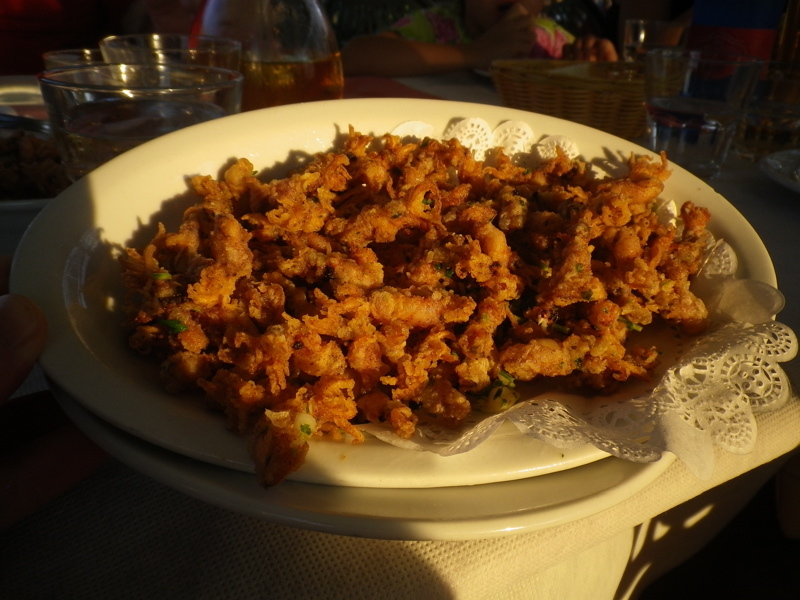 Moscardini fritti, so tasty……. Yes, here I am taking pictures of food in a restaurant, which is annoying. It is for research, I swear! We had such delicious food at Da Tony, and I want to try making some of these at home, if I can find some semi-decent seafood. 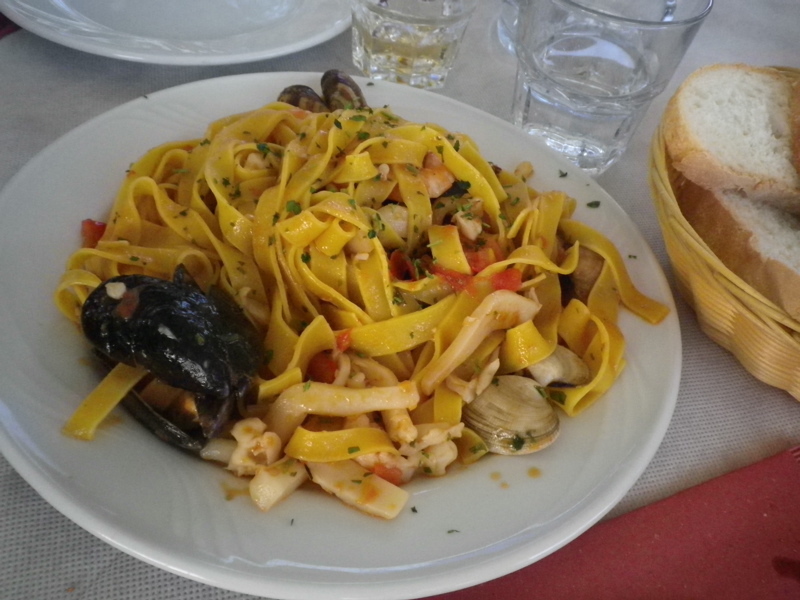 Tagliatelle alla scoglio (scoglio roughly means rock emerging from the sea): cozze, vongole calamari (mussels, clams, squid), scampi, cherry tomatoes, garlic, parsley, mmm…..
Tagliolini with coda di rospo, pachino and rughetta. Very tasty. 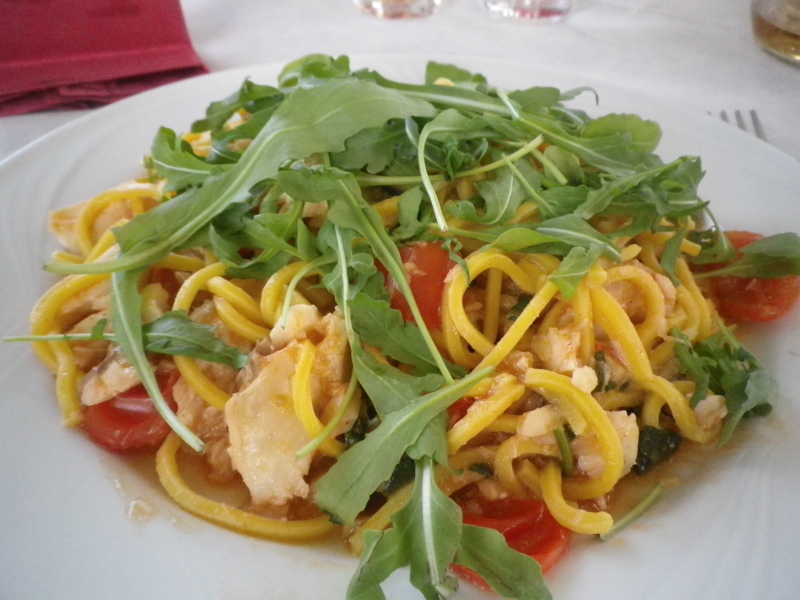 Now, if I had brought along Daniel Etherington’s excellent guide Italian names for fish and seafood, I would have known what I was eating……..
coda di rospo – what a great name. It literally means “tail of the toad” or “toad’s tale”. The other common name for this fish is rana pescatrice, “frog fisherwoman”. Slightly more prosaically, we call this type of monkfish “anglerfish” (Lophius piscatorius), though other English names are frog-themed. Some more colourful Italian names are: diavolo de mar (“sea-devil”, also a name used in English apparently), rospo di fango (“mud-toad”), pisatrice nera, etc. Novel names aside though, the angler is really one of the core species to not eat, and it’s been on the Greenpeace Red List since 2010. Even the UK Marine Conservation society rates it as 4 (with 5 the worst). This is all making me really hungry….. Now, some seafood for dinner, I think. Tonight we are making a recent Venetian-inspired recipe from The Telegraph, which looked fun: Sardines with Campari, peach and fennel recipe. Must go start the sardines now, they are already marinating in grated peaches and Campari. 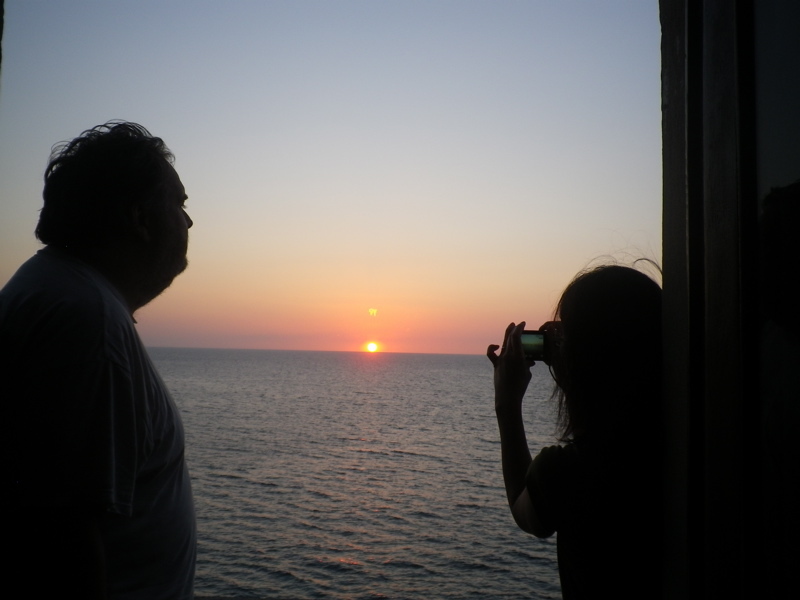 If we could then add the sound of the waves, a nice sunset and an evening sea breeze, it would be just perfect! 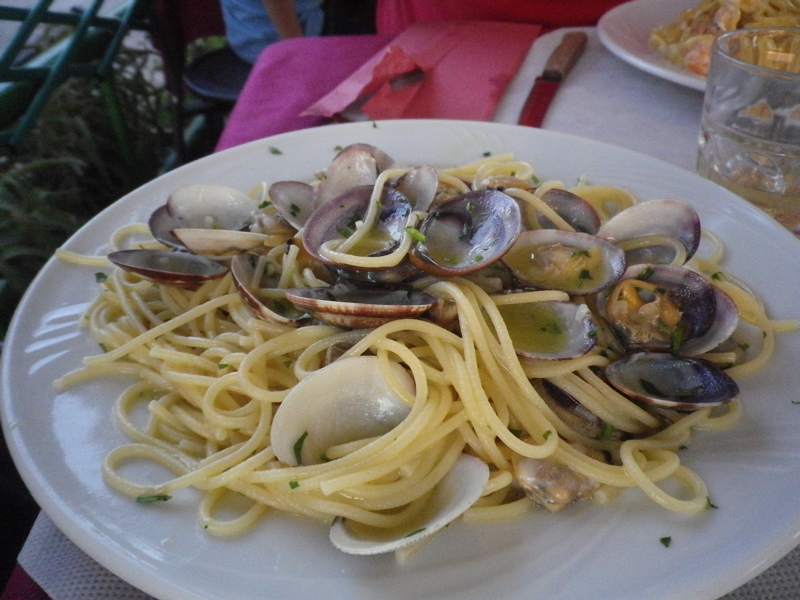 This entry was posted in Italy, travel and tagged Giglio, pasta, seafood, Tuscany on August 6, 2013 by krumkaker.